We live in a time of new technologies like cryptocurrencies, social media, and online accounts. These are broadly known as digital assets and it is not always clear what we truly "own" and where our rights go if we are unable to manage these assets. 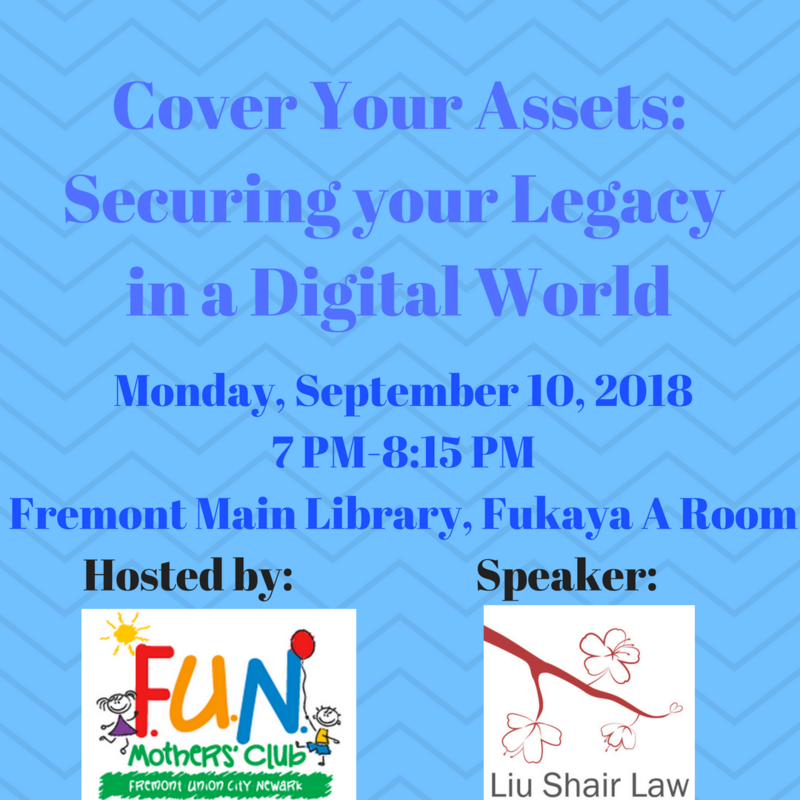 We will go over what digital assets are, who manages them, and steps you can take now to determine what happens with your assets. This will be an interactive and informative session, followed by time for Q&A. Shannon Liu Shair is an Estate Planning attorney who grew up in San Jose, California. She received her bachelor's degree in Psychology from UCLA in 2007 and her law degree from Boston University in 2011. She has been an active volunteer and community leader throughout both her educational and professional careers. In fact, her first pro bono act as a law student was to write a will for an elderly woman in need. She loves helping people with this important planning, using her Psychology background to get to know people and truly understand their wishes. She has built her firm on the philosophy of providing customized, comprehensive, and compassionate services to clients. Aside from being an attorney, she is the Community Outreach Coordinator for Fremont Union City Newark Mothers' Club and the mother of two young children. Children are welcome to attend; because this event is held at the library, they can even bring books to read in the meeting room.